After my recent exhibit at TAMP Coffee a lot of people asked me about how the ‘Liquid Gold’ series of metallic prints were made. The key aspect is that instead of printing with inks, each image is made using ultraviolet light on a special printer. The resulting images go on to have a high level of detail whilst also retaining a slight degree of reflectivity. Whilst not being exactly mirror-like, there is still enough reflection in each image to make them burst with light at certain viewing angles which makes for a unique viewing experience. In addition to this it also creates a highly durable print which can even be shown both indoors and outdoors. To explain how this process works I thought I would create a short “making of…” video to show the prints being made and the level of care that goes into creating each one of these limited edition prints. I’m delighted to say that one of my photographs has been shortlisted for the new Freshfields Photography Prize created by law firm Freshfields Bruckhaus Deringer. The shortlist of 10 images has been chosen from the 2013 Renaissance Photography Prize finalists. The winner will be voted for by the firm’s 4,500 international staff with Freshfields Bruckhaus Deringer matching each vote cast with a £1 donation to The Lavender Trust at Breast Cancer Care Charity. I’m particularly pleased to hear that the judging criteria was based on images that “they personally found particularly striking or engaging”. The selected photo was from my set on the London Gay Pride Festival of two men kissing which will be exhibited as a print from 3rd – 7th September at the Wapping Project Bankside. Tickets for the awards ceremony cost £55, with all proceeds going to The Lavender Trust at Breast Cancer Care Charity to support younger women with breast cancer. Tickets for the awards are available by contacting tickets@nullrenaissancephotography.org. This morning I was delighted to hear that one of my photos has been selected for the Renaissance Photography Prize 2013. The photo they have selected is one from my set on the London Gay Pride Festival of two men kissing. I’m really pleased that this image has been chosen as I always felt it had a lot of power visually for being only a spontaneous, instinctive shot of a couple on a dance floor. I was using a wide angle lens that day so I was close to them as it looks. Shots like these are only possible if the subjects around you are relaxed with you being there so I’m very grateful for the trust that was given from everyone around. It’s so much about attitude and the way you carry yourself and I’ve been very fortunate to have many unpaid tutors push and nudge me in the right direction when it comes to this. Now in its sixth year all the photos from the Renaissance Photography Prize finalists will be exhibited as prints from 3rd – 7th September at the Wapping Project Bankside (which is a stone’s throw from the Tate Modern on London’s Southbank). There will be a champagne reception and awards ceremony on 5th September where the main winners for Best Single Image, Best Series, as well as the three Category Winners(Single Images) and the Runner-Up Prize (Series) will be announced. Tickets for the awards ceremony cost £55, with all proceeds going to The Lavender Trust at Breast Cancer Care Charity to support younger women with breast cancer. Tickets for the awards are available by contacting tickets@nullrenaissancephotography.org. Welcome to the new web site. After a long time in the coming I’ve decided to act upon all the bits of advice that has been offered over the last four years (i.e. be on twitter, be on facebook and so on.) So now that it’s here, what’s different? For those of you that can remember my last web site, it was mainly just photographs; a big long strip of them with very little text to speak of. What I wanted to do with this one was make it more engaging – because that seems to be at the heart of todays’s social media revolution – the ability to share engaging content. Sharing is great but it asks for something more than just “here’s a nice photograph, have a look”. It asks for something deeper. The story behind the photograph, the point it’s trying to make and a glimpse into the photographer’s thinking. So that’s meant lots of writing – which for me was something of a joyful re-union. Despite having spent a lot of my time avoiding it, particularly at school where it felt like an obligation, writing is now something else; the ability to use words and adjectives to compliment the tone, colour and composition of my photographs. I can’t guarantee the writing will always be good – that’s for you to decide – but it will be there. Whenever I set out editing photographs – of which I knew there was going to be a lot to do in the making of this site – I also knew it was going be painful. There are always going to be lots of casualties as your darlings are piled up and killed off in the name of quicker download times, and more importantly, holding onto a viewer’s interest. However this editing process also forced me to confront my back catalogue. Photographs that have laid dormant on various hard drives waiting for a day when they could come out into the sun. 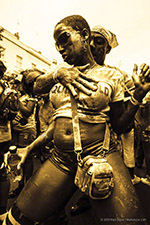 The ‘Liquid Gold‘ photo story about the Bachanal Mas carnival band is a case in point. Shot on the day before I made my first pilgrimage to VISA Pour L’Image, it’s been nagging me ever since. I had suffocated it like some many other photo stories for fear that it might not be as good as it had initially felt. Years pass, more shots get taken and for the most part what you’d previously thought was great generally suffers with the passing of time. However I always thought those dancers smeared in gold might look great printed in black and gold (as opposed to black and white). As it turns out they do so it’s case of new work found in old clothes. As a result I’ve been back-to-the future a fair bit in making this web site and brought out some other previously forgotten photo stories into the sunlight. After looking at a lot of other photographer’s sites I decided I wanted to do something different: I wanted to create a discussion. It really feels like the internet has brought the world closer in a very short space of time. Now photographers can now show their work online, 24/7, 365 days a year to what was a previously unattainable, global audience. That’s great but what about using the internet to work together instead of working in isolation? Photography could be justly described as a spectator sport and you can feel pretty isolated developing a story so I thought I’d take a chance. Normally photographer’s web galleries only show finished work but I’ve decided to publish a ‘Work In Progress‘ one as well. Photo stories can sometimes be months (even years) in the making and during that time nobody knows what you’re doing -which can be a good thing if you are breaking a new story – but also a bad thing if at the expense of not gaining other people’s help. So I thought I’d put some stories out there that are still in mid development. Maybe a writer, journalist, editor or even print collector might be interested. Maybe not. -Who knows? But to my way of thinking, too many images sat on a hard drive can easily go sour whilst waiting for the bottle to be poured. So let’s see. Before I wrap up this first post a huge thanks must go out to Kieron Jansch, Chris Vika, Daniel Hubbert, Christel Stol and Magdalena Bak-Maier for all their help and advice during the building of this web site. I’m not a born coder and regularly struggled putting this together but fortunately I had their talents to fall back on. Thanks for reading and I hope you like what you see. If you want to get in touch by all means contact me here through the web site or a leave a comment on the blog posts.